AKA Frederick Lincoln Wray, Jr.
Blues and rock guitarist, credited with inventing the power chord. 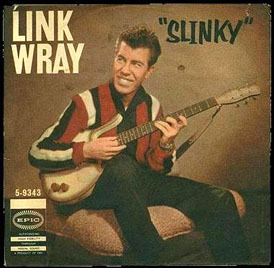 Wray is best known for Rumble (1957) by Link Wray and the Raymen, which placed in the American Top 20. An instrumental, it was banned on some radio stations for its raw sound. Another single, Rawhide (1959), hit #23, and he had another hit with Jack the Ripper (1963). His music had great appeal among the "wrong crowd" much to the consternation of his record company.